The Marianist Province of the United States is making a $1.5 million gift to elevate the present Father William J. Ferree Professor of Social Justice to an endowed chair and place an enduring stamp of Catholic Social Thought and Marianist character on the academic life of the University of Dayton. By transforming the current position into the Father Ferree Endowed Chair of Social Justice, the Marianists intend to continue Ferree’s legacy as a leader in Catholic Social Thought and social justice, and build on the work of President Emeritus Brother Raymond Fitz, S.M., who has served as Ferree professor since it was created in 2002. “Father William Ferree was very forward thinking and a man ahead of his time. He was a leader in advancing and developing existing Catholic Social Thought beyond charity, looking at the structures of society that create poverty and defining our responsibility to work for the common good,” said the Rev. Martin Solma, S.M., Marianist provincial. 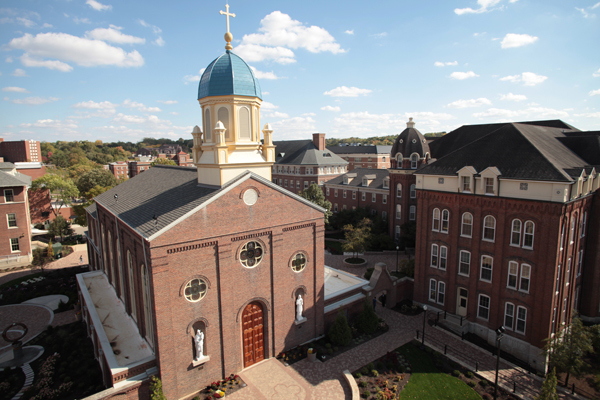 UD President Eric F. Spina said the Marianists’ gift will further strengthen the University’s commitment to advance scholarship, teaching and community engagement in social justice in pursuit of the common good. The Ferree professorship was established in 2002 with an initial gift of $1 million that has grown to $1.5 million. The Marianists will add an additional $1.5 million to fully support the endowed chair. As the current Ferree professor, Fitz, who served as UD president from 1979-2002, works within the Fitz Center for Leadership in Community, the academic center named in his honor, to foster collaboration, leadership and creation of community and neighborhood partnerships through community-engaged education. He plans to continue as Ferree professor until the new position is filled, and then expects to continue teaching and community engagement work at the University as a senior lecturer in social justice. “This position can work with faculty to make leadership in social justice and the common good a key feature of our curriculum here at the University,” Fitz said. “We do a decent job now, and this position can make it a great deal better. UD Provost Paul Benson said the chair will work with academic departments and programs across the University. “The Ferree Endowed Chair will have broad responsibilities to foster collaborations across the University as well as partnerships beyond campus to help position UD as a leader in higher education that advances social justice in pursuit of the common good,” Benson said. Benson said the University plans to launch a national search for a scholar who is a practicing Catholic with an outstanding reputation for teaching and scholarship in the Catholic social tradition. Born in Dayton, Ohio, in 1905 and a two-time UD graduate, Ferree was a respected Catholic theologian whose work on the common good has been highly influential in shaping contemporary Catholic teaching on social justice. Ferree's thinking revolved around the act of social justice, the moral responsibility to continually reorganize society for the common good. His theory argues that the understanding of this concept of social responsibility — as opposed to individual responsibility — is relatively new in human history, and that we all have a responsibility to work toward solving the disparities and social injustices that exist in the world.